Abia State Commissioner for Works Mr Eziuche Ubani has reacted to the raid carried by men of the Department of State Security Services and the Nigerian Army at his Obingwa country home today. Mr Ubani a former Federal House of Representative member now Abia State Commissioner for Works said if institutions of the Government could be used to innocent Nigerians like him, then he wonders where Nigeria is heading to. Ubani was speaking at his Ovom residence Tuesday evening to members of the Press. 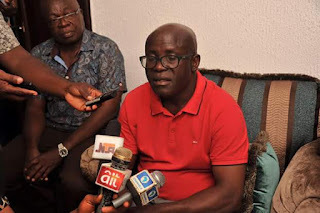 He said the Department of State Security Services led by Stephen Agu of the Headquarters of the DSS in Abuja told him that they heard a report that he was Stockpilling Guns and training people to assassinate key members of the All Progressives Grand Alliance in Abia State.